Transfer music/videos/images from iPod/iPhone to Mac, transfer iPad to iTunes. Innovative software acquisitions from the specialized in download internets sites! Use the asked-for software sections, learn the freshest refreshes of the cool solutions, and setup straight off! Do not lose an option to download the best software applications: apply SoftEmpire directory to get software system for free. Have a look on the library of free programs and software package test versions. select among operating system apps, setup managers, playgames, and all other varieties of apps for your laptop or digital accessory! Tipard iPad Transfer for Mac can help you copy many media files, including video, audio, image, Podcast, TV shows, etc. from iPad to Mac or iTunes Library. What's more, this iPad transfer for mac supports connecting multiple Apple devices simultaneously, and it is perfectly compatible with all iPhone models and many other Apple devices. What's more, it highly supports iPhone5, iPod Touch5 and iPod Nano7 now. With Tipard iPad Transfer for Mac, you can easily copy iPad music, movie and images to any folder on Mac in few clicks. 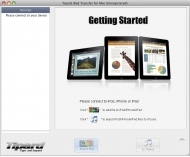 Under the help of Tipard iPad Transfer for Mac, you can transfer iPad files to iTunes for sharing or backup. Selecting music, videos and images you want to backup via play list, this Mac iPad Transfer will transfer them to Mac automatically. Tipard iPad Transfer for Mac supports iPod 1G, iPod 2G, iPod 3G, iPod 4G, iPod classic, iPod mini, iPod nano 1, iPod nano 2, iPod nano 3, iPod nano 4, iPod nano 5, iPod shuffle 1, iPod shuffle 2, iPod shuffle 3, iPod touch, iPod touch 2, iPod Video, iPhone, iPhone 3G, iPhone 3GS, iPhone 4, iPad and iPad 2. Tipard iPad Transfer for Mac can auto-scan your iPod/iPhone devices and auto-search by Album/Artist/Genre. With only few clicks, you can finish the whole process.